I’m in the mood for a picnic today. We somehow managed to get seven inches of snow last weekend, out of nowhere, and that’s more snow than has ever fallen where I live. It was 60 degrees the day before the snow fell, and now, less than a week later, the temperature is in the 70s and the sun is shining. Because of the shade that my front porch gets during the day, it’s still covered in 2 or 3 inches of snow and ice, despite the fact that all I want to do is go to the park and sit in the grass and feel the sun. 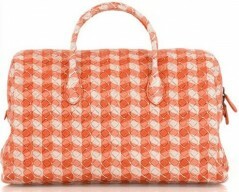 And the Bottega Veneta Boston Intrecciato Tote looks like a picnic to me. The orange check pattern would probably be picnic-y even on flat leather, but when you add the extra visual element of Bottega’s signature woven construction, there is just enough depth to really remind me of the ever-present outdoor tablecloths (but in a good way). The intricate texture of pattern-on-pattern limits the number of ways this bag could be worn, but if extra cash on hand wasn’t a problem, it seems like it would be a lot of fun to pair with something solid-colored…I’m picturing a royal blue linen sundress for a bit of contrast. Buy through Net-a-Porter for $2350.